What Facts Should I Know about Diabetic Eye Disease? Which Specialties of Doctors Treat Diabetic Eye Disease? What Is the Treatment for Diabetic Eye Disease? What Is the Medical Treatment for Diabetic Eye Disease? What about Surgery for Diabetic Eye Disease? What Medications Treat Diabetic Eye Disease? Do I Need to Follow up with My Doctor after Being Diagnosed with Diabetic Eye Disease? What's the Prognosis for Diabetic Eye Disease? Diabetes is one of the leading causes of irreversible blindness worldwide, and, in the United States, it is the most common cause of blindness in people younger than 65 years of age. Diabetes may cause a reversible, temporary blurring of the vision, or it can cause a severe, permanent loss of vision. Diabetes increases the risk of developing cataracts and glaucoma. How can you tell if diabetes is affecting your eyes? Some people may not even realize they have had diabetes for several years until they begin to experience problems with their eyes or vision. Diabetes also may result in heart disease, stroke, kidney failure, and circulatory abnormalities of the legs. In the United States 1.5 million new cases of diabetes are diagnosed every year. In the US in 2012, the total annual cost of diagnosed diabetes was 2.45 billion. Eighty-four million people in the US have prediabetes, and 9 out of every 10 don't know they have it. Of the 84 million people with prediabetes, without lifestyle changes 15% to 30% of them will develop type 2 diabetes within 5 years. Lifestyle management has been shown to reduce the risk of developing type 2 diabetes and prediabetes by at least two-thirds. It can also slow or halt the progression of prediabetes to diabetes. Watch your diet, especially limiting unhealthy types of fats and substituting complex carbohydrates for simple carbohydrates. Participate in an exercise program. Try to exercise for least 30 minutes, five days a week or more. There are many ways to accomplish this without any expense. Go for a walk after lunch or dinner, ride bikes with the kids, plan an activity with a partner or friend, or rent an exercise DVD. Always check with your health-care professional before starting any exercise program. Don't smoke or quit if you do. Monitor blood sugars and glycosylated hemoglobin as recommended by your doctor. Take diabetes medications as prescribed. Severe diabetic eye disease most commonly develops in people who have had diabetes for many years, and who have had little or poor control of their blood sugars over that period of time. Blindness is strictly defined as the state of being totally sightless in both eyes. A completely blind individual is unable to see at all. The word blindness, however, is commonly used as a relative term to signify visual impairment, or low vision, meaning that even with eyeglasses, contact lenses, medicine or surgery, a person does not see well. Diabetic eye disease can cause permanent visual loss, which may be mild or severe. Given modern treatment options, it is unusual today for diabetic eye disease to cause the total inability to see. Proliferative diabetic retinopathy and diabetic macular edema, if untreated can result in significant loss of vision. Blindness from diabetic eye disease is similar to blindness from other causes. All people who are blind or have visual impairment have the common symptom of difficulty seeing. People with similar levels of visual loss may have very different responses to that symptom. If one is born blind, there is much less adjustment to a non-seeing world than there is for people who lose their vision late in life, where there may be limited ability to cope with that visual loss. Support systems available to individuals and their psychological makeup will also modify the symptom of lack of sight. People who lose their vision suddenly, rather than over a period of years, also can have more difficulty adjusting to their visual loss. Associated symptoms, such a discomfort in the eyes, awareness of the eyes, foreign body sensation, and pain in the eyes or discharge from the eyes may be present or absent, depending on the underlying cause of the blindness. The visual loss associated with diabetic eye disease, if due to vitreous hemorrhage in proliferative diabetic retinopathy, may be sudden in onset. It may clear slowly, as the blood obstructing the vision is absorbed by the body. A person who is blind from diabetic retinopathy may have no visible signs of any abnormalities when sitting in a chair and resting. Depending on the degree of blindness, the affected individual will exhibit signs of visual loss when attempting to ambulate. Some blind people have learned to look directly at the person they are speaking with, so it is not obvious they are blind. If the person has fairly large, rapid shifts in their blood sugar levels, they may notice that their vision becomes blurry. This may occur prior to the diagnosis of diabetes mellitus, or it may develop after the initiation of treatment or a change in treatment of diabetes mellitus. This difficulty with vision or focusing will disappear once blood sugar levels have been stable for approximately one week. Even if the person has background diabetic retinopathy or early proliferative diabetic retinopathy, it is possible that they may not have any symptoms, or they may experience mild-to-severe blurring or vision loss. Many people with severe diabetic eye disease may not realize that they have a vision problem until it is too late and permanent damage has already occurred. If the person has a cataract, vision may become blurry or hazy. At night, the person may experience glare from oncoming lights. If the person has glaucoma, they may not experience any symptoms until a significant loss of vision has already occurred. In diabetic eye disease due to diabetic retinopathy, symptoms of pain or discomfort in the eyes are usually not present. Over many years, high blood sugar (hyperglycemia) and other abnormalities in metabolism found in people with diabetes may damage the blood vessels in the body. This damage to the blood vessels leads to poor circulation of the blood to various parts of the body. Since the function of the blood is to carry oxygen and other nutrients, this poor circulation causes decreased oxygen delivery to tissues in different parts of the body and subsequent damage to those tissues. Some of the most sensitive tissues to decreased blood flow and oxygen delivery include the brain, heart, kidneys, and the eyes. Lack of adequate oxygen delivery to these areas causes strokes, heart attacks, kidney failure, and vision loss. Rapid shifts in blood sugar levels: Many people with diabetes may notice that their vision becomes blurry when they have fairly large, rapid shifts in their blood sugar levels. This temporary blurring is because the sugar in the blood can diffuse into the lens of the eye and cause it to swell, thus changing the focal point of the eye and resulting in blurring of the vision. Over time, repeated swelling of this type is thought to damage the lens and cause it to become cloudy, resulting in a cataract. The high blood sugar levels also may eventually damage the cells lining the trabecular meshwork toward the front of the eye, where the fluid (called aqueous humor) flows out from within the eye. When these cells are damaged, the trabecular meshwork cannot function correctly. If the trabecular meshwork does not function correctly, the fluid cannot flow out of the eye properly and the pressure inside the eye can increase. This high pressure inside the eye can damage the optic nerve and cause permanent vision loss. This process is called glaucoma. Diabetic eye disease can cause a wide range of problems that affect the eyes, in particular the retina, the lens, and the trabecular meshwork. The primary part of the eye affected by diabetes is the retina. The retinal abnormalities from diabetes are called diabetic retinopathy. Most people with diabetic retinopathy have the problem in both eyes, although the severity of the disease may vary between the eyes. The retina can be thought of as the film in a camera. If the film in a camera is faulty, the resulting picture will be blurry. In a similar manner, if the retina of the eye is swollen, wrinkled, or otherwise structurally damaged, the vision in that eye will be blurry. Depending on the type, location, and extent of damage in the retina, the change in vision will range from minimal to severe and be temporary or permanent. In people with diabetes, changes in the walls of the small blood vessels in the retina are caused by blood sugar abnormalities. These small blood vessels may begin to "balloon," forming what are called microaneurysms, as well as leak fluid, as well as leak fluid (called edema) and blood (called retinal dot and blot hemorrhages) into the retina. This process is called background diabetic retinopathy or nonproliferative diabetic retinopathy. If fluid accumulates in the central part of the retina (called the macula) and causes swelling there, the process is called diabetic macular edema. As a response to decreased oxygen delivery to the retina, new abnormal blood vessels may begin to grow within the retina, a process called neovascularization. The presence of neovascularization defines proliferative diabetic retinopathy. Although new blood vessels may sound like a good thing, considering that the old blood vessels are damaged, the new blood vessels are actually more harmful than beneficial. The new blood vessels are extremely leaky and fragile, potentially leading to bleeding inside the eye (called vitreous hemorrhage) resulting in vision loss. If not treated appropriately, this vision loss may be permanent. If the new blood vessels are extensive, they may cause scarring inside the eye, resulting in tractional retinal detachments, which is another cause of permanent vision loss. In cases of severe proliferative diabetic retinopathy, new blood vessels may grow on the surface of the iris, causing neovascular glaucoma, a particularly severe form of glaucoma. Not infrequently, the need for amputation of a toe, a foot, or the lower leg. Even if the person is not experiencing any symptoms due to diabetes, the person should have an annual eye examination by an ophthalmologist (a medical doctor who specializes in eye disease and eye surgery). If the ophthalmologist notices any significant signs of diabetic eye disease or if the person requires treatment, exams may need to be scheduled more frequently than annually. If the person notes any significant changes in vision other than a mild temporary blurring, they should contact an ophthalmologist immediately. Are there any signs of permanent damage to my eyes from diabetes? Is there any significant loss of vision? If so, is this loss of vision permanent? Are there any signs of cataracts or glaucoma? Do I need any treatment at this time for any problems with my eyes? How often do I need to be examined? Ophthalmology is the specialty of medicine that deals with diagnosis and treatment of eye disease. The ophthalmologist is the appropriate person to both diagnose and treat diabetic eye disease. Some ophthalmologists limit their practice to diseases of the retina. A general ophthalmologist can decide whether or not the specific patient requires and evaluation by a subspecialist in retinal disease. People with diabetes also will be cared for by their family doctor or internal medicine specialist and other subspecialists as needed. Visual acuity, which is the level of detail a person can see, is checked. If the patient's visual acuity is not 20/20, testing may include refraction to determine if glasses will improve vision. The patient's visual field, which is the area (or "field") in which a person can see other people and objects, is also checked. The front portions of each eye is examined using a special microscope, called a slit lamp, to check for cataracts and other abnormalities. Tonometry is a method used to measure the pressure inside the eye. If the pressure is increased, it may indicate glaucoma. If signs of glaucoma are noted, a formal, computerized visual field examination may be performed. Visual field testing checks the peripheral (or side) vision, typically by using an automated visual field machine. This test is done to rule out any visual field defects due to glaucoma. 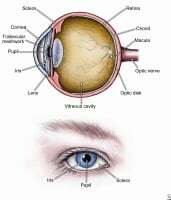 The ophthalmologist examines the patient's retina to check for diabetic retinopathy; this requires dilation of the pupils with eye drops to ensure an adequate examination of the retina. If significant signs of diabetic retinopathy are noted, a fluorescein angiogram may be done to help show the extent of damage done to the retinal blood vessels and to help guide treatment. During a fluorescein angiogram, a yellow dye is injected into the blood vessels of the hand or the arm; this dye travels all over the body through the blood vessels, and film or digital photographs are taken as the dye travels through the blood vessels in the retina. Where the blood vessels in the retina are damaged, the dye may leak out of the blood vessels. This leakage and its location are shown on the photographs. Another test that may be performed in patients with diabetic macular edema is and optical coherence tomography (OCT). This is a painless quick method of evaluating the retina using laser light to image the retinal layers and measure the retinal thickness. Treatment of diabetic eye disease can be prevented or controlled with lifestyle changes like a healthy diabetic diet, exercise, close monitor of blood sugars, taking medications as prescribed by the doctor, and quitting smoking. Medical treatment for diabetes includes medication or lifestyle changes. Medical treatment of diabetic eye disease is generally directed at the underlying problem - the diabetes itself. The better control a patient has of the disease, the fewer problems they will have in the long run. Monitoring the patient's glycosylated hemoglobin (hemoglobin A1C, Hb1AC) is the best assessment of the overall level of blood sugar control. A medical doctor will order this blood test at least once a year. If the patient's results are initially found to be abnormal or if the patient's self-test blood sugar results become more variable, then this blood test may be ordered more frequently. For diabetic retinopathy, available medical treatment includes injections of corticosteroids or anti-vascular-proliferative medications in the area around the eye may be used. The presence of glaucoma requires the use of antiglaucoma medications in the form of eye drops. For focal/macular photocoagulation or grid macular photocoagulation is performed. During this laser treatment, performed in an ophthalmologist's office, a highly focused beam of laser light is used to treat the leaking blood vessels or to treat the area of retinal swelling. In the absence of macular edema, non-proliferative diabetic retinopathy requires no laser treatment. For proliferative diabetic retinopathy, panretinal photocoagulation (PRP) is performed. During this treatment, the entire retina, except for the macula (the center of the retina), is treated with laser spots to decrease the oxygen demand of the retina and remove the need for these new blood vessels to grow. If extensive growth of new blood vessels, extensive scar tissue formation, tractional retinal detachment, or severe bleeding inside the eye has occurred, a vitrectomy is performed. During a vitrectomy, usually performed in an operating room at a hospital or an out-patient surgical center, the vitreous (a gel-like fluid) and the blood inside the eye are removed and replaced with a clear fluid. In some of these cases, a vitrectomy combined with laser treatment and/or retinal detachment surgery is required. The most important method of preventing eye disease related to diabetes is to maintain strict control of blood sugar. High blood pressure and high lipid or cholesterol levels must also be treated to decrease damage to the blood vessels within the eye. The most common problem with the most potential to cause blindness is diabetic retinopathy. Currently, effective oral medications or eye drops do not exist to directly treat diabetic retinopathy, and surgery (for example, laser) is the treatment of choice. Investigational drugs by injection around the eye or taken orally are currently being studied to determine their effectiveness in preventing and treating diabetic retinopathy. Depending on the type of glaucoma, treatment may include medications and/or surgery. Intraocular pressure usually can be lowered using different medications in the form of eye drops. Some oral medications may also be prescribed, but their use is rare. Various types of eye drops are commonly used, and more than one type of eye drop is often needed to lower intraocular pressure. Beta-adrenergic blocking agents, prostaglandins, carbonic anhydrase inhibitors, alpha-adrenergic agents, miotics, and sympathomimetic drugs are examples of eye drop medications used to treat glaucoma. All of these medications lower intraocular pressure. Prostaglandin eye drops include latanoprost (Xalatan), bimatoprost (Lumigan), travoprost (Travatan), unoprostone (Rescula), and tafluprost (preservative free Zioptan). Beta-blocker eye drops are timolol (Timoptic), levobunolol (Betagan, AKBeta), betaxolol (Betoptic), and carteolol (Ocupress). Carbonic anhydrase inhibitors include the eye drops brinzolamide (Azopt) and dorzolamide (Trusopt), and the oral medications acetazolamide (Diamox) and methazolamide (Neptazane, GlaucTabs). Oral medication is rarely used for an extended period of time because of the side effects. Adrenergic agonists and sympathomimetic eye drops include brimonidine (Alphagan). Sympathomimetic eye drops include dipivefrin (Propine, AKPro), and epinephrine (Eppy, Glaucon, Epinal, Epifrin). These are rarely used today. Miotic eye drops include pilocarpine (Isopto Carpine, Pilocar, Piloptic) and carbachol (Carboptic, Isopto Carbachol). These are rarely used today. Dorzolamide and timolol ophthalmic (Cosopt) is a commonly used eyedrop that combines a beta-blocker (Timolol) with a carbonic anhydrase inhibitor, dorzolamide (Trusopt). Brinzolamide and brimonidine (Simbrinza) also combines two medications into a single eye drop, including a carbonic anhydrase inhibitor and an adrenergic agonist. If you or someone you know has diabetes and mild diabetic eye disease, follow-up examinations with an ophthalmologist every year may be all that is necessary. If the person has more serious disease, more frequent follow-up appointments with an ophthalmologist are required based on the severity of the disease. If you or someone you know has diabetes, "an ounce of prevention is worth a pound of cure." take diabetic medications as prescribed. Even if you have not been diagnosed with diabetes, a healthy diet, maintaining a normal weight, exercising regularly, and not smoking are advisable. This is especially important in light of the new, more accurate definition of diabetes that estimates 84 million people in the United States have prediabetes, a condition that significantly increases the risk for developing this disease. The earlier diabetic eye disease is diagnosed and treated (if necessary), the better the prognosis. For those with diabetic retinopathy, the prognosis is determined by the severity of the disease. In mild cases and in those treated early, the person may not even notice any problems with their vision. In severe cases, relentless and progressive irreversible vision loss may occur despite the best treatment. Cataracts are easily treated with cataract surgery, and, if the vision loss is due to cataracts, almost everyone undergoing cataract surgery sees better afterward. Vision loss as a result of glaucoma is usually prevented by the use of antiglaucoma eyedrops. American Diabetes Association. "Statistics About Diabetes." Updated Apr 1, 2016. Centers for Disease Control and Prevention. "Prediabetes." Updated Aug 6, 2015. U.S. Department of Health and Human Services. "Small Steps. Big Rewards. Your GAME PLAN to Prevent Type 2 Diabetes: Information for Patients." Centers for Disease Control and Prevention. " National Diabetes Prevention Program." Updated Jan 14, 2016. What symptoms have you experienced due to diabetic eye disease? Please share your experience with diabetes and eye disease. If known, what was the cause of your case of eye disease associated with diabetes, and what problems have you experienced? What medical treatments have been effective in managing your diabetic eye disease?